The BREDA design is a bit more complicated than the OTO. A noteworthy feature is the less rigid safety bar linkage. Rather than being directly attached by a rigid hinge, a thin brass band connects the safety bar to the fly-off lever. The Allways fuze is driven by a mushroom shaped striker. 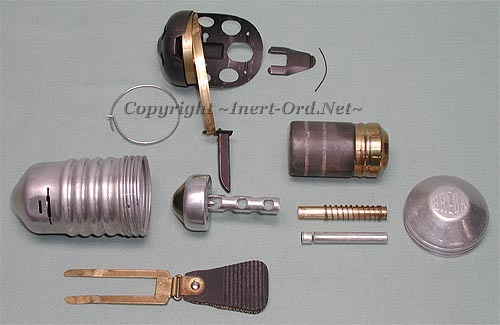 The primer/detonator is contained in a brass tube which fits inside the larger tube extending from the striker. A creep spring separates the two. The thin wire ring locks the two body halves together at a specific place so as not to bind the internal parts. As with the OTO, the pull tab with the attached safety strip was removed just prior to throwing, which unlocked the safety lever. When thrown, the lever was to catch the air like a drogue chute and pull the safety bar from the body arming the grenade. It seems the main advantage of the BREDA design, over the OTO, is a loose and less binding fit of the safety bar mechanism which likely made it a bit more reliable. The BREDA as configured prior to impact. Once the safety bar has departed, the firing pin is kept separated from the primer by the coil creep spring pushing the det tube away. The Allways fuze concept is intended to cause the grenade to detonate no matter how it hits the target. o Impact Bottom First - Momentum presses the mushroom striker downward into the primer. o Impact Top First - The HE capsule pushes the primer/det tube up to the striker. o Impact from any side - The striker and HE capsule push sideways and the top and bottom sloped walls compress the assembly forcing the firing pin and primer together. Fabricating the BREDA is clearly more involved than the OTO. Besides having more components, the striker assembly is made up of multiple formed and press-fit parts, as is the explosive capsule. 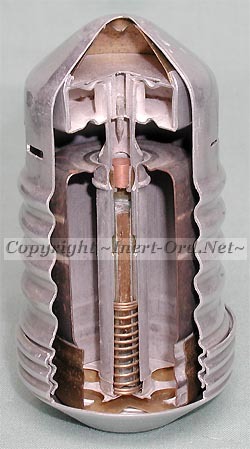 The top cavity of the striker was filled with lead shot which provided the necessary mass to actuate the fuze (bottom impact) and also provided a secondary fragmentation effect. As with the OTO, I can't see how this was a practical fragmentation "matrix" as the result was certainly anything but a uniform pattern.